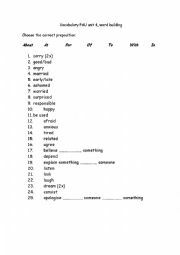 FCE sentence transformation exercise. Re-write the second sentence so the meaning is similarto the first. There are 48 sentences of more complex sentence structures. Answers given! Excellent for revision before exam!! A brief guide to writing a short story. Some ideas and vocabulary. 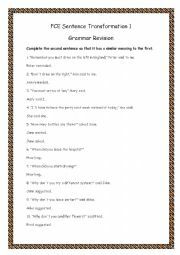 Re-write the second sentenceso that it has a similarmeaning to the first. This is the second part, answers given! Enjoy! 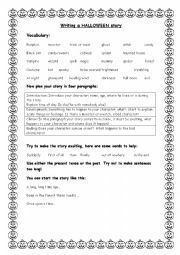 Simple grammar exercises to give students more practice, may be used as a test. Phrasal verbs and word building, unit revision. 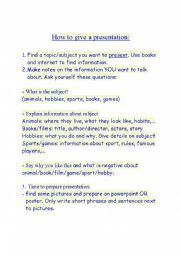 Gives basic guidelines for how to prepare and do a short presentation. 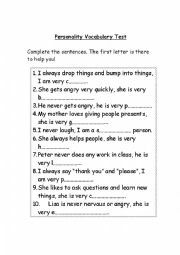 A short test based on some vocabulary we studied, just to check they are understanding it. 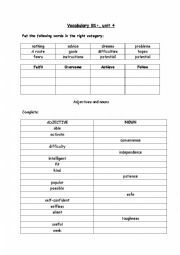 Some adjective/verb preposition revision. Enjoy! A simple presentation explaining how to write a report, some examples are given of useful phrases. I hope it�s useful!